Making time to see a doctor can be tricky, and Googling symptoms is a surefire way to give yourself hypochondria. Online consultations with real doctors could be a good middle ground, but just talking or texting with a patient often isn't enough for a doctor to make an accurate diagnosis. To give a telepresence doctor more presence, the new OnMed Station is equipped with HD cameras and various sensors, and can even dispense drugs as prescribed. Medical telepresence has the potential to be revolutionary, but so far it's been fairly clunky. There are robots that roam around hospitals and let doctors check up on patients remotely – but it's mostly a hands-off approach, letting them see and chat to patients from afar and look over their medical charts. The OnMed Station is designed to give physicians a far richer telepresence. Patients step inside what looks like a futuristic phone booth, and are put in touch with a doctor they can see and speak to. As well as inspecting a patient's vitals through video and audio, the doctor can get readings of their height, weight, BMI, blood pressure, respiration and blood oxygen saturation. The booth can even take thermal images to check body temperature or diagnose infection. At the end of the visit, the OnMed Station can dispense medications from a reserve of hundreds of the most common drugs. If what's needed isn't in stock, it can instead print out a prescription that a patient can then take to a pharmacy. And if keeping an ample supply of drugs on-hand sounds like a security risk, OnMed says it's all locked up in a "secure, automated vault." Privacy is also a concern, and the OnMed Station is designed to address that in a few ways. When someone enters the booth the door automatically locks behind them, and to make sure they can't be seen or heard from outside, the door is made of switching glass that frosts over, and the directional speakers are arranged so only the patient can hear the doctor's voice. To make sure everyone is who they say they are, the system uses 3D facial recognition to identify patients. Going the other way, all doctors will be licensed in the state that the station itself is in, and their credentials will be displayed on the screen for the patient to see. 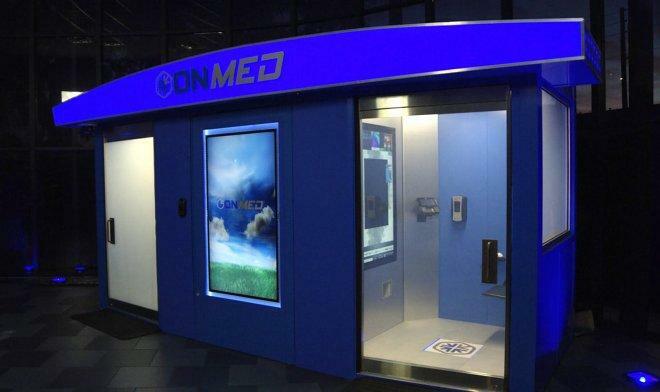 OnMed says the station allows patients to be in and out in under 15 minutes, which saves everybody time and frees up hospitals and emergency rooms. To keep things sanitary, the OnMed Station is kitted out with ultraviolet lighting to sterilize the air and all surfaces in the booth between patient consultations. OnMed is rolling out these stations in the US this year. The idea is that they'll be installed in places like colleges, large-scale employers, airports and hotels, and a visit should cost about as much as a regular doctor's appointment. That said, the company says that these costs might be rolled into tuition fees at colleges, or be part of a workplace health plan.